Good morning. I (Mary-Ann) wanted to share a layout that I create on Veteran's day. Not only did I take the picture that day, I even scrapped it! Never have I ever been so efficient! I am pretty proud of myself. I wanted to use the repeating circles as my theme throughout this layout. I love the photo and wanted it to be get the attention so I decided on pastel, white washed papers from Fancy Pants - Collecting Moments line. This line could be used in SO many ways. There is a dark rich blue that is calling my name! I started by punching out circles with my 3" circle punch and my Wplus9 Circle Stackers I Die. Because the colors were a tad bold, I tones them down with spraying them with white linen Dylusions ink and white embossing powder. I decided on my photo and circle placement, then began my watercoloring. I shaved my favorite gelatos colors onto a paper plate and mixed them with water. 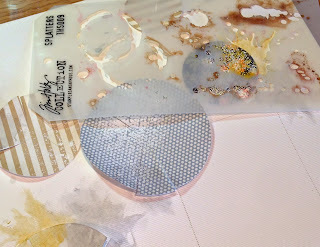 Using my layering stencil, I started making my mess. I may not be a master but it sure was fun! You will see on the layout that I even colored the wood veneer shapes with the same gelatos liquid. I added my title, pieces from the matching embellishment packet, small decorative tags, resin flowers, Jillibean doilies and wood shapes, and added flair! Thank you for taking a look at my layout. Be sure to thank a Veteran, it is never too late. Love your layout!! Oh my goodness, your water-coloring and the paper colors are perfect!! I love how you used the Dylusions to tone down the color, I am going to have to use that trick!! Oh, girlie, you got grungey! I LOVE it!! I love the circle theme on this layout. The altering of the paper both with Dylusions and gelatos worked like a charm and gives the layout a painterly feel which is so cool. I must give the gelato shaving a try...cool results. Great photo of your guys! This is so pretty, Mary Ann!! Love how you altered the color of the paper. Will have to give that a try for sure. Lovely layout. Beeeautiful layout Maryann and woohooo on doing it all on the same day and gettin messy,lol. The splatters are GREAT!!! I LOVE your color combo and the look of the water color.